This article is about Jiralhanae variant Plasma rifle. For standard variant, see Type-25 plasma rifle. 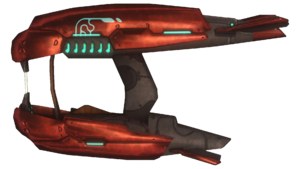 The Brute plasma rifle, known as the "blood-hand" by Jiralhanae, is a modified version of the Covenant's Type-25 Directed Energy Rifle used by the Jiralhanae. Unlike the original, which is manufactured by the Iruiru Armory, the Brutes' variant was designed and produced in secret by High Charity's Sacred Promissory. The Type-25 Brute plasma rifle variant was originally manufactured at the Sacred Promissory assembly forges in preparation for the High Prophet of Truth's takeover of the Covenant. Under its crimson plating, the artisan-engineers in Truth's employ were allowed to make modifications to the rifle's sacred design pattern specifically tailored to the aggressive nature of the Jiralhanae. These changes would have been deemed heretical without a hierarch’s direct blessing – a blessing Truth was more than happy to offer. Even in the aftermath of the collapse of the Covenant empire, newly manufactured Brute plasma rifles continue to appear in the hands of mercenaries and raiders, though their source is unknown. It is classified as an Uncommon REQ and can be summoned in Warzone at Level 3 energy while giving 75 REQ points if sold. The Brute Plasma Rifle is a Covenant directed-energy weapon that uses a superheated ionized gas called Plasma instead of projectile ammunition. The weapon is powered by a battery cell. The weapon has a power output of 100-150 KV @ 2~3 dA, and can fire 360~540 rounds per minute. Unlike the Plasma Pistol, the plasma rifle is capable of semi-automatic and full automatic fire; this is thanks in part to its dual plasma collimator design. Placed atop one another, these collimators fire in a "stagger" taking the slow automatic fire of each individual collimator and combining it, this design allows a faster rate of fire and more rounds per second. The Type-25 DER/J is considerably different than its Sangheili issued counterpart; unlike the standard plasma rifle the Jiralhanae variant fires a more powerful bolt at a higher rate of fire, boosting penetration and kinetic impact over its Sangheili issued counterpart. The only visual differences between the two weapons is that it is red and is darker towards the back of it. The top half of the Brute Plasma Rifle is also longer towards the end than its Sangheili counterpart which is a more comfortable hold for Brutes. Unlike other weapons utilized by Brutes, it is not only the only Brute weapon that does not look somewhat primitive, but also the only one that does not have blades for close-quarters combat. So far this variant has only been found in the hands of the Brutes, and even then, only since they have seen a return as front-line combatants. Against infantry, the lethality of the Jiralhanae Variant of the Type-25 DER is considerably greater than its counterpart due to its higher rate of fire at close range. Injuries inflicted to a victim are severe third-degree burns, this level of injury causes the wound to be cauterized instantly upon impact. Body fluids would be subjected to flash vaporization, inducing a strain or a shock on the body after impact, fluids trapped in organs or arteries in addition to the rapid expansion of heat would cause ruptures or small explosions causing additional damage to the target. Near misses can also cause injury to the target, as they produce severe burns to the area they pass, this can also cause heat trauma or heat stroke from the extreme temperatures of the bolt. Should the plasma impact an object, the impact can cause splash damage creating debris both non-heated and heated that may come into contact with a target, with a crippling or lethal effect. Generally, two hits from either a Plasma Pistol or Plasma Rifle will kill a light or non-armored target. Like its counterpart, over-extended periods of firing can overheat the weapon, causing it to become unusable for a short period of time. In the context of the Halo games, all plasma weapons' strength and lethality are compensated for the sake of gameplay. The Type-25 DER/J is a close to medium range weapon, and as such can inflict very high damage at close range. The Jiralhanae variant is strengthened by a higher discharge rate, doubling the rifle's efficiency - this higher discharge rate allows for higher velocity thus doubling the kinetic impact to targets at close range. The Type-25 DER/J can easily kill lightly or non armored targets with two strikes, against heavily armored targets the Type-25 Jiralhanae Variant can inflict double the damage then the standard Type-25 DER. 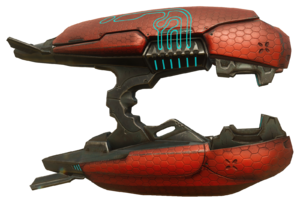 SPARTAN-IIs can dual-wield plasma rifles, doubling their efficiency in close to medium range combat situations. The plasma rifle's high velocity bolt coupled with its kinetic impact to a target can temporarily stun a target like a SPARTAN-II. The Type-25 DER/J is even more prone to overheating than its standard counterpart after expending four percent of its battery because of the rapid cycling, loading, ignition, and release phases; to prevent the weapon from being damaged, the Type-25 DER temporarily shuts down and opens heating vents to allow the excess heat to dissipate before the weapon reactivates. At 10% charge level, the plasma rifle will begin to misfire, this is due to the battery's inability to deliver enough energy to start and complete the ignition and release phase of operation, hampering the operator's use of the weapon. Human military experts and scientists do not understand how Covenant plasma weapons work, or how they are recharged; as such, when the battery is depleted, the rifle must be discarded or replaced. The Type-25 DER/J is not suited for long range combat, due to several distinct properties of the weapons operation. The first is the rate of thermal expansion which is determined by the rate of the bloom of the bolt, blooming is the result of plasma breakdown in the air at energy densities of around a megajoule per cubic centimeter. This effect causes the plasma to defocus and disperse energy into the atmosphere. It can be more severe if there is fog, smoke, or dust in the air. As the bolt is accelerated away from the "barrel" of the weapon the plasma begins to decay as a result of the weakening magnetic field. Speed also factors in to this, the faster the bolt is accelerated, the farther the bolt will travel before the temperature of plasma begins to decay and the magnetic field becomes unstable and finally dissipates. As the bolt loses velocity it also loses kinetic damage as it travels longer distances. Sorrow of Teash: The warlords who control marauding Brute fleets and thrall colonies have the resources to procure the services of expert weapon smiths from across known space. Improved Brute Plasma Rifle with better accuracy and upgraded heat dissipation. It is classified as a Rare REQ and can be summoned in Warzone at Level 4 energy while giving 100 REQ points if sold. Scale of Soirapt: Built in the image of the lifeless corpse-moon that orbits Doisac, with secrets that only the most cunning Jiralhanae can unlock. Advanced Brute Plasma Rifle with increased damage, but can also serve as an utterly lethal melee bludgeon. It is classified as an Ultra Rare REQ and can be summoned in Warzone at Level 5 energy while giving 150 REQ points if sold. Functionally identical to the Type-25 plasma rifle from Halo 3, albeit colored red. In the campaign, this weapon is identical to its original depiction in every aspect. In multiplayer, this weapon overheats at roughly the same speed. Increased damage, takes a Spartan's shields down in 4 shots and kills in another 8. A vast improvement over the 18 shot kill Brute Plasma Rifle from Halo 2 and Halo 2: Anniversary. Overheats much more quickly, similarly to the original Brute Plasma Rifle from Halo 2. Like all other weapons in Halo 5: Guardians, it can be smart-scoped. The first level that the Brute Plasma Rifle appears in-game is Gravemind. In Halo 2 the "wings" on each side of the Brute Plasma Rifle appear to be burnt or distorted, while the Elite version keeps a normal color. It, along with the Sentinel Beam are the only weapons not shown in the Halo 2 instruction manual. The Brute Plasma Rifle appears once again in Halo 3: ODST and now replaces the Elite Plasma Rifle version. This is because Elites only appear as corpses in ODST. Bungie may have inserted the Brute Plasma Rifle into the game due to lack of time to create a new Brute weapon. It is arguable that the Brute Plasma Rifle is the predecessor to the Spiker of Halo 3, since both are similar in function and rate of fire. However, the Brute Plasma Rifle has made several subsequent appearances, including alongside the Spiker, firmly establishing it as its own distinct portion of the Brute arsenal. Because the Brute Plasma Rifle does not appear in Halo 3, Brutes instead wield the standard Plasma Rifle alongside their other weapons. The exact reason for this is unknown, as it is the only game in which Brutes use the standard Plasma Rifle at all. Strangely, the Brute Plasma Rifle only appears by default in one Halo 2 multiplayer map, Turf. The Plasma Rifle and Needler in Halo 3 have exactly the same rate of fire as the Brute Plasma Rifle. They all start off slowly, then rapidly gain speed until it either overheats, or the battery is drained. The Brute Plasma Rifle has a slightly higher tone than the regular Plasma Rifle, due to the higher rate of fire and Brute design. The Yanme'e in Halo 3: ODST are now able to use this weapon with deadly precision. The Drones that use these weapons, are either a pale yellow or red color, and have energy shields like the Sangheili. In Halo 3: ODST, the weapon is extremely similar to the regular Halo 3 Plasma Rifle. The pickup is even called a Plasma Rifle instead of a Brute Plasma Rifle. This is because it is a re-skinned version of the Halo 3 Plasma Rifle. In Halo 3: ODST, a Brute carrying a Brute Plasma Rifle will appear to reload the weapon after using it for a while, by reaching toward his left calf and seems to be doing the reload animation for a Type-25 Spiker. This is not possible however, because the rifle is run by a plasma battery. The Brute Plasma Rifle replaces the standard Plasma Rifle in Halo 3: ODST. This is odd, because in Halo 3, the Brutes are never seen using it. The T-25 Brute plasma rifle was added to Halo 5: Guardians in the Memories of Reach update. It is not featured in the campaign, as there are no Brutes. Initially, when the Brute plasma rifle was added to Halo 5: Guardians, it had the sounds of a plasma pistol. However, after the release of the Warzone Firefight update, the weapon received more unique sound effects. A profile view of the Brute Plasma Rifle from Halo 2. The Brute Plasma Rifle in Halo 2. A visual comparison between the standard Plasma Rifle and the Brute Plasma Rifle. Two Brute Captains wielding Brute Plasma Rifles in Halo 2. The Brute Plasma Rifle in Halo 3: ODST. A right-side view of the Brute Plasma Rifle in Halo 3: ODST. A Brute Pack wielding Brute Plasma Rifles in Halo 3: ODST. A study of the Brute Plasma Rifle. A study of the weapon's projectile. The Brute Plasma Rifle in Halo 2 Anniversary. John-117 using a Brute Plasma Rifle in Halo 2: Anniversary. John-117 dual wielding Brute Plasma Rifles in Halo 2: Anniversary. First-person view of the Brute plasma rifle in Halo 2: Anniversary multiplayer. A Spartan using a Brute plasma rifle on Stonetown. A Spartan dual-wielding Brute plasma rifles. First-person view of the Brute Plasma Rifle in Halo 5: Guardians. Smart scope with the Brute Plasma Rifle. The Brute Plasma Rifle overheating in the player's hands. A Centurion-clad Spartan-IV using smart scope with the Brute Plasma Rifle. A Centurion-clad Spartan-IV with an overheated Brute Plasma Rifle on Stasis. An Indomitable-clad Spartan-IV with a Brute Plasma Rifle while doing a ground pound on Stasis. A Sangheili Warrior with a Brute Plasma Rifle on Attack on Sanctum. A Cyclops-clad Spartan-IV with the Sorrow of Teash on Prospect. A Spartan-IV with the Scale of Soirapt. REQ Card of the Sorrow of Teash. REQ Card of the Scale of Soirapt. Tem'Bhetek wielding a modified Brute Plasma Rifle during the Ambush at Duraan. A Brute Plasma Rifle in Halo Online. A Brute Plasma Rifle wielded by a Jiralhanae during the Second Ark Conflict in Halo Wars 2. Atriox firing a Brute plasma rifle in Halo: Rise of Atriox.